Carbrooke is in the Breckland district of Norfolk, located to the east of Watton and south of Shipdham. The name is Old English and is translated as ‘stream in the marsh’ or ‘dark stream’. An alternative interpretation suggests that Car may be a Celtic river name. There is only one modern settlement concentration at Carbrooke village and Carbrooke Hall is located some distance away from the village. Prehistoric evidence is concentrated in the village, but there is a second minor concentration to the north of the parish. The earliest finds are two Neolithic axeheads (NHER 8761 and 8763) and a Neolithic arrowhead (NHER 8762). A wide range of Bronze Age objects have also been found including a rapier (NHER 8810), an Early Bronze Age axehead (NHER 39360), a spear (NHER 8763), a Late Bronze Age socketed axe (NHER 24212) and a Bronze Age mould (NHER 8814). A Late Iron Age gold coin (NHER 25084) depicting a wolf has also been found. Scatters of prehistoric burnt and worked flint (NHER 8792, 15896, 39928, and 33323) have also been identified and a prehistoric ditch (NHER 8814) has been excavated on the preceptory site. There is clear evidence of Roman activity. One small scatter of Roman pottery has been identified (NHER 33323). Several Roman coins (NHER 8811, 24219 and 31703) have been recovered, including fourteen from one site along with a Roman brooch (NHER 24218). It is not clear if these represent a hoard or are evidence of occupation. Another group of Roman finds may be a Roman settlement (NHER 32975). It is in the north of the parish away from the Watton Roman road (NHER 8786) that runs west to east. Another unusual find was the possibly Roman copper alloy sculpture of the head of Hadrian (NHER 28053), but this might be a post medieval copy. 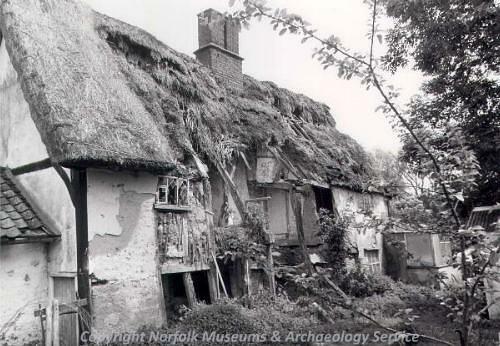 It is rare to find clear evidence for Saxon occupation in Norfolk, but in Carbrooke a Late Saxon building (NHER 8814) has been excavated on the site of the later preceptory. Metal detecting has also recovered one Early Saxon and one Middle to Late Saxon strap end (NHER 32975 and 33271) from the area. The Middle Saxon example is decorated with animal motifs. Saxon pottery (NHER 3323, 40115 and 40120) has been collected from the possible Roman settlement and at two other spots in the parish suggesting occupation was more widespread in this period than it is now. 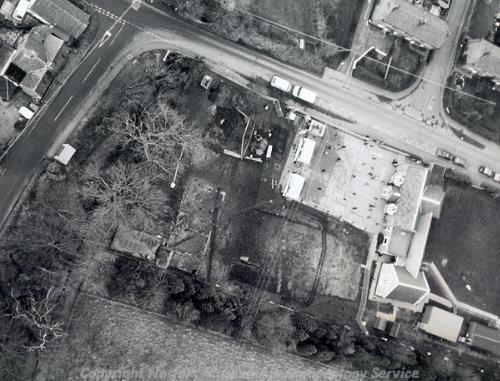 The modern village of Carbrooke is now centred around the medieval site (NHER 8814) of the preceptory of the Knights of St John (a military monastic order similar to the Knights Templar) that was established in 1173 and was in use until Henry VIII closed it down in 1540. The site is represented by a series of well-preserved earthworks and parch marks visible on aerial photographs. Buildings on the site were excavated in 1998 during the extension of the local primary school. A fourth fishpond filled in with kitchen rubbish (including swan, heron, songbirds and lobster) in the 15th century was also discovered. Occupation wasn’t only found in Carbrooke in the medieval period however. Earthworks of Little Carbrooke deserted village (NHER 17893) can be seen on the western boundary of the parish close to the site of Little Carbrooke church (NHER 8792) that was pulled down in 1424. There are also earthworks of medieval tofts (NHER 20838) and a possible medieval moat (NHER 8820) within the parish. The Striped Cottage is a medieval hall house (NHER 21919) that was built around 1500. The church of St Peter and St Paul, Carbrooke (NHER 8794) dates to the 13th century. There are more industrial remains surviving from the post medieval period including two saw mill pits (NHER 8830 and 12151). There are records of two windmills, one towermill that still stands (NHER 15954) and a post mill that closed in 1900 (NHER 15254). A watermill (NHER 37149) is marked on an old map. Several post medieval buildings are still standing (NHER 12354) and the location of one has been identified by the presence of building material in the field (NHER 8768). There is also some interesting World War Two archaeology in the area. Part of Watton Airfield (NHER 8908) extends into the south part of the parish and there are several pillboxes (NHER 32422, 32424 and 32426) that were related to the defence of the airfield.